From the Personal Files of Marilyn Monroe: Utility bills for gas, and water and power. 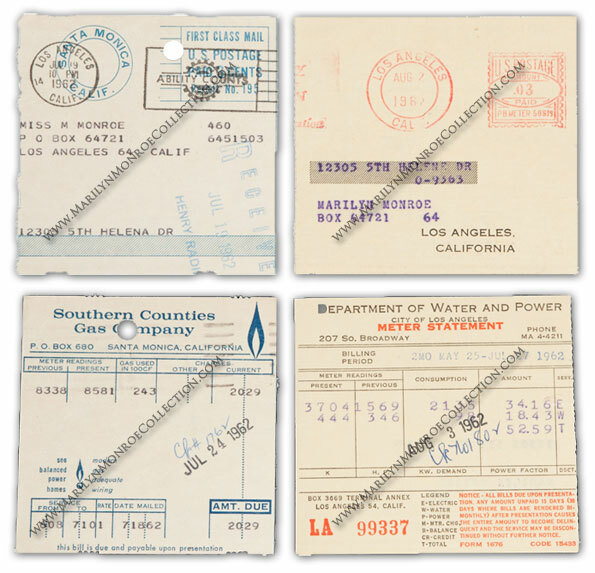 The first from Southern Counties Gas Company, date-stamped by MM’s secretary “Jul 24 1962,” addressed to “Miss Monroe / PO Box 64721 / Los Angeles 64 Calif,” but noting that service was for her home at “12305 5th Helena Dr.,” in the amount of “$20.29;” the second from the Department of Water and Power, date-stamped “Aug 3 1962” (just two days before MM’s death), addressed to “Marilyn Monroe / 12305 5th Helene [sic] Dr.,” in the amount of “$52.59.” Sadly, these would be the last bills Marilyn would receive before her passing in August. Also part of the Marilyn Monroe Collection, Marilyn Monroe bank check #1802, made payable to Department of Water and Power in the amount of $52.59. This check was prepared on August 3, 1962, and Marilyn died before signing it. A startling and poignant symbol of Marilyn’s unexpected passing.